It is a grim name, though it has nevertheless brought hope of a better future for many in Argentina: Vaca Muerta - translated from the Spanish - means "Dead Cow". Vaca Muerta's barren landscape covers some 30,000 remote sq km of the Patagonian province of Neuquen, in the west of Argentina. And it was here where energy giant Repsol-YPF struck gold last year. Black gold. Buried in 250-million-year-old rocks, almost 3km beneath the surface here, are some of the world's largest reserves of shale oil and gas. According to the Spanish energy giant Repsol, there are prospective resources equal to more than 21 billion barrels of oil underneath the ground in Vaca Muerta. Much of it could be shale oil, rather than gas, according to an independent Ryder Scott audit commissioned by Repsol, though this has yet to be proven. But the presence of shale gas is proven, and it is clear that the reserves found here will make up a big proportion of the country's estimated 22 trillion cubic-metre total. 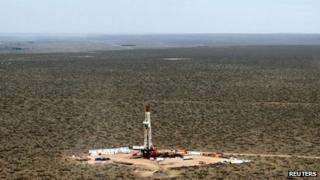 That makes Argentina the world's number three in terms of shale gas reserves - hot on the heels of the US, which has reserves of some 24 trillion cubic metres, and China, which has reserves of some 36 trillion cubic metres, according to the American Energy Information Administration. Getting the reserves out would obviously require massive investment. Argentina's government believes Repsol - which has been active here ever since it took over YPF when it was privatised during the 1990s - should have done this. But instead, it says, Repsol has been dragging its feet, invested too little and thus failed to get the resources out of the ground as quickly as it should have done. The government has even accused Repsol of pulling YPF's profits out of the country to finance its businesses abroad. President Cristina Fernandez said: "If such a situation continued, we would have had big energy problems in the country because of the drop in production and the increasing reliance on fuel imports." So the government has of what it sees as a vital, national asset. Renationalising YPF has in effect helped the government regain control of the Vaca Muerta energy reserves, since the rights to exploit more than a third of the area were held by Repsol-YPF. The move, and the manner in which it was made, has obviously created a great deal of controversy. Repsol and others believe the government was motivated by a desire to secure the country's energy requirements for decades to come, and thus reduce its gas import bill which shot up to $10bn in 2011 and is expected to surge to $14bn this year. "This could help cope with between 30% and 40% of the gas demand within Argentina, which has been covered with costly imports in the last two years," says Eduardo Barreiro, an energy consultant and a director at the Society of Petroleum Engineers in Argentina. Argentine economist Rodrigo Alvarez Litre agrees. "This is the real reason behind the renationalisation of YPF," he wrote in a column in the Argentine newspaper, Perfil. "With such shale gas reserves, Argentina could position itself as a nation with cheap and abundant energy, and profit from the high prices in the international market." Argentina's government might describe its move as a step towards self-reliance, which it believes is clearly in the nation's interest. "Vaca Muerta could be a very important area in the future," Mr Barreiro says. Some $3bn would be required over the next three years to get the shale gas extraction started. And then, he added: "You'll need to be excavating constantly to keep the production levels high enough to justify the investment and to make a profit." According to Repsol, more could be achieved with more investment. The firm insists that some $25bn per year would be needed to exploit Vaca Muerta's shale oil and gas potential. This, the company believes, could double the Argentine production in 10 years. But this would require some 3,000 shale oil and gas wells in an area where there are only 28 at the moment. Without Repsol, the government might well look to other foreign investors for help to make it happen. But Daniel Kokogian, a geologist who works as an advisor for several foreign energy companies in Argentina, said some companies would be concerned about how they might be treated in the future, following the renationalisation of YPF. "What private investor would put money into a business where national interest will come first, then profits?" he asks. Others are far more optimistic about Argentina's chances to attract foreign investors. The government says it has already had talks with energy giants such as Total of France and Petrobras of Brazil - and local energy analyst Victor Bronstein expects deals to be struck. "Oil companies are constantly operating in turbulent environments, in problematic countries," he says. "If they think there's a business opportunity, that there's a possibility of resources, they'll dive in." Besides, cash-rich states may well be keen to get involved, according to Mark Routt, a senior consultant with KBC Advanced Technologies in Houston, Texas. "Argentina is going to have to look for government-government relationships, particularly with China," he says. But Mr Kokogian says he believes the main concern of most investors will be whether or not Vaca Muerta is going to deliver decent margins. "The main issue here is to determine if these estimated resources can actually be called reserves," he said. "A resource becomes a reserve when it is proven that the investment can be recovered with an acceptable profit. In Vaca Muerta, I don't think that has happened yet. "If this area was truly the main reason behind the nationalisation of YPF, then Repsol may have shot itself in the foot over an unproven source of energy," he adds. And if that turns out to be the case, the Argentine efforts to control "Dead Cow" could be a bit like flogging a dead horse.